Although Flight 93 Memorial Site looks barely more than a common field, it has been recognized as a "Field of Honor Forever." September 11, 2001, will go down in history as the day that changed America. Those of us who lived through this horrible day will always be asked from younger generations, "Where were you on 9-11?" I doubt if anybody in America can honestly say, "Gee, I don't remember." 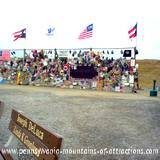 This Pennsylvania Memorial has quickly become the most visited PA Attraction in history. On the morning of September 11, 2001, four commercial airliners were hijacked shortly after takeoff. It was a well thought out planned attack against the United States. Two of those flights were flown into the World Trade Center in New York City. A third plane was flown into the Pentagon in Arlington, Virginia. The fourth plan never made its destination. It was heading for Washington D.C. to crash into The White House. Flight 93 left Newark, NJ, behind schedule that September morning. After a 41 minute delay on the runway, Flight 93 began it's journey to San Francisco, CA at 8:42 a.m. At 9:28 a.m. as the Boeing 757 was nearing Cleveland, Ohio, the hijackers attacked. Flight 93 was forced to change course. The plane made a sharp turn heading southeast toward our nation's capital. Shortly before 10:00 a.m. witnesses on the ground in southwestern Pennsylvania saw the plane flying low and erratically. At 10:03 a.m. Flight 93 crashed, at an estimated speed of 500 mph, into a reclaimed strip mine at the edge of the woods in Somerset County, Pennsylvania. Emergency responders arriving at the scene minutes after the crash found no survivors. All thirty-three passengers, seven crew members, and the four hijackers were killed. Etched in our memory of that horrible day are the courageous words of Todd Beamer, "Let's Roll!" Todd's wife heard those two famous words over the phone, right before flight 93 crashed in Somerset Country, Pennsylvania. Since then those words have been used by many, including our U.S. President, George W. Bush, as a sign of courage and determination to defend our country. 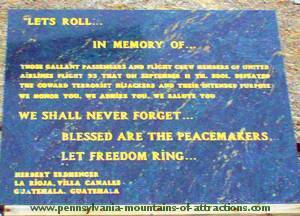 A monument has been placed at the Flight 93 Memorial with those brave words of Todd Beamer inscribed. "Let's Roll!" 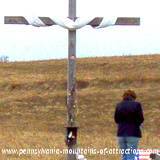 DO YOU HAVE A PICTURE OR MEMORY OF PENNSYLVANIA YOU'D LOVE TO SHARE WITH THE WORLD? Just click on the link below - it's so easy! The days following 9/11 were, for many, a nightmare of events. People from around the world were glued to their television sets watching the rescuers work through horrible unhealthy conditions. Who could forget the cement covered faces of the many firefighters, policemen, and volunteer rescuers? I'll never forget the haunting sound of the bagpipes playing as the rescuers brought out the many victims of the horrible tragedy. Today those same Heroes are suffering from health problems. The victims of 9/11 mount day by day. These unsung heroes are finally being recognized but not fast enough. We need to fight for these rescuers to get health benefits. Write to your congress and fight for them, they no longer have the strength. 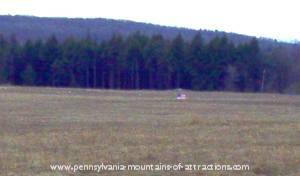 Visitors started arriving almost immediately after the Boeing 757 crashed into the field in Shanksville, Somerset County, Pennsylvania. 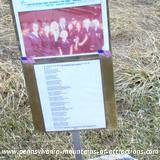 Realizing the need for a temporary memorial in Pennsylvania, local officials and volunteers created a temporary memorial on a hilltop overlooking the crash site. In excess of over 100,000 visitors that visit this temporary memorial each year. At the temporary Flight 93 Memorial visitors see a 40' long section of fencing which has become a collage of flowers, flags, handwritten messages, artwork, and tributes of every description. Along with the fence there is also an array of painted rocks, crosses, plaques, ball caps, patches, flags, and angels left at the site. There are also journals in which visitors may write their thoughts. It has become a beautiful tribute of the heartfelt messages of the nations feelings about this event and the heroes who were aboard Flight 93. It's been a long process. The decision was finally made to choose the design for the Flight 93 Memorial. The families of the crash victims were involved in the decision of the design, which will make this memorial a personal tribute to not only heroes, as we know them, but to their precious loved ones. There are many fund raising projects under way, along with generous donations that will help finance this memorial. It has been estimated to cost 30 million dollars to finish it. In the end, it will be a beautiful tribute to those 40 heroes and the sacrifices they chose to make on that beautiful September morning. The Flight 93 Memorial design set forth a new form unique to its landscape and the historic event on September 11, 2001. This design will be open to natural change, keeping in mind the landscape, weather, and maturity over time. The beautiful design will not only reflect the beauty of the landscape through the Allegheny Mountains, it will be designed to showcase all four seasons. In my opinion, the most exciting part of The Flight 93 Memorial Design will be the Tower of Voices. This will consist of 40 wind chimes, for each honored hero at this sacred site. Tower of Voices will be erected on Route 30, high enough to be seen from the Pennsylvania highway. This will be located at the entrance and exit to The Flight 93 Memorial. The Pennsylvania Mountain breeze will bring life to the 40 white wind chimes, the sound is to reflect the living memory of the 40 passengers. Whose last contact was through their voices. 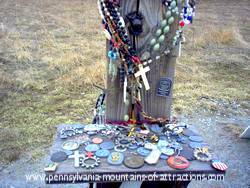 While you are in the area, why not visit other Pennsylvania Memorials through the Allegheny Mountains? About an hours drive from Shanksville, PA you will find The Viet Nam Memorial , in Altoona, PA. Also known as The Wall That Heals. 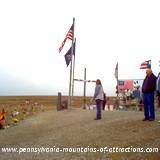 You'll enjoy the beautiful view and roadside attractions as you travel along Pennsylvania's Historic Lincoln Highway. 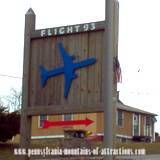 Along this route is where you'll find the Flight 93 Entrance Sign. If you would like to see the design plans and/or make a donation to The Flight 93 Memorial, click on the official Flight 93 website link that I have provided below for your convenience. From Exit #110 of the PA Turnpike, follow signs for Rte 281 North.Take Route 281 North 9.5 miles to US 30 at Stoystown.Travel 2.4 miles East on US 30 to Lambertsville Road.Travel 1.7 miles on Lamertsville Road to Skyline Road.Travel 1 mile on Skyline Road to the Temporary Fight 93 Memorial. 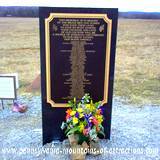 Turn left on Buckstown Road, 25 miles West of Bedford.Travel 3 miles on Buckstown Road to Skyline Road.Travel 1 mile on Skyline Road to the Temporary Flight 93 Memorial. Turn right on Lambertsville Road, 2.4 miles East of Stoystown.Travel 1.7 miles on Lamertsville Road to Skyline Road.Travel 1 mile on Skyline Road to the Temporary Flight 93 Memorial.